Kenton's Infotainment Scan: The good-teaching pie chart: mm-mm good! Got a hankerin' for a heapin' helpin' o' good teachin'? 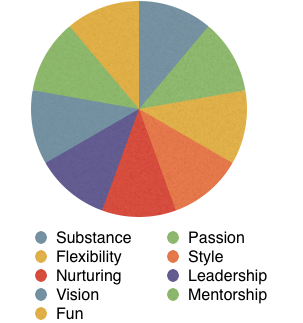 Well, take a bite of the good-teaching pie chart, which consists of all the things that teachers are supposed to do in order to make the learning experience and classroom environment the magical places they can and should be. Most good instructors excel in one of these areas, juggle most of them well, and have one or two areas that need work. This year, I master "nurturing!" Stop laughing. It's also worth noting that there are some high and low combos that are disastrous for teachers: being substantive but boring is useless. Being very entertaining without substance is Jersey Shore. And what's missing? I suppose "humor" could fit into "fun" and "style," but it bears its own shout-out. For teachers, it's just like it is with new comedians: the best humor is of the self deprecating variety: the teacher is the self, and everyone else deprecates him! Of course, a teacher is only as good as his or her institutional support: if students don't know how to do their work because the teacher didn't show up today: that's the teacher's fault. If generations of students don't know how to do their work because the teacher didn't show up: that's the institution's fault. Lastly, if as a teacher or student, you feel a little nervousness before the school year begins, don't sweat it: that's nature's way of telling you that you care and want to do a good job - the most important piece of all. How nurturing. I feel better. Thanks Kenton.